I setup PingPlotter to run for one night straight, pinging my localhost, router, and Comcast.net. There’s no packet loss between my computer and router, or local PC, so I’m ruling out my hardware as the issue. The packet loss happens soon as it hits the second hop. Its goes on frequently from 6 pm to 10 am. 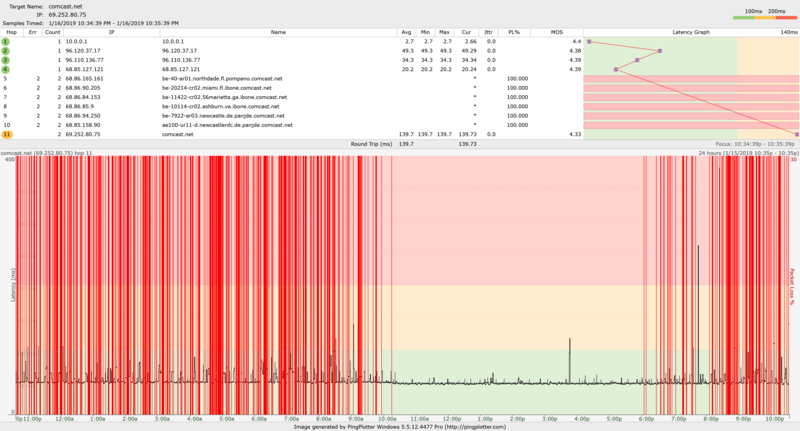 After 10 am there’s no packet loss. Is this some sick experiment? I'm going to re-escalate your issue to the Comcast corporate employees that are available to these boards. Good luck ! Hi, Accould. That sounds very frustrating! I'm sorry to hear the issues are continuing. We can definitely take another look at this. It does appear that there are still some issues with the signal levels on your modem. I know you have had a couple recent technician visits and it's possible that there might be some work going in your area. Please send me a private message with you name and I will take a look at everything on my end and help you determine what we can done from here. Is this really maintenance or work being done in the area? There zero information provided in the status map. It was great working with you, Accould. I'm glad to hear that your internet service is working as expected again. If you need anything else regarding this concern, you are welcome to send me a private message. Otherwise, take care. Thank you for your time!